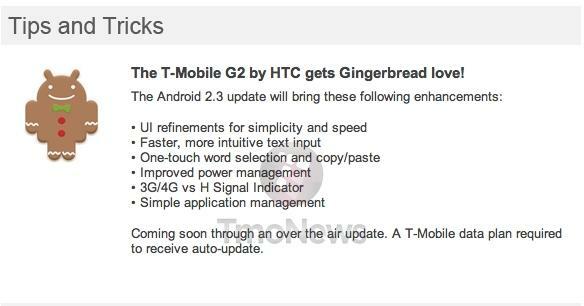 In a newsletter sent out yesterday HTC continues to tease the impending update for T-Mobile G2 users to Gingerbread. This reads exactly like the last update we received with a similar list of enhancements without a firm over-the-air date. The G2 was T-Mobile’s first 4G phone and as such it has a special place in our hearts so we hope that the powers that be at HTC and T-Mobile don’t make G2 owners wait that much longer. ← HTC Preparing Software Update To Unlock Sensation 4G Bootloader? HTC and its fake promises. Stop throwing out empty words , while making profits out of it, and update your all damn phones!!!!! Really the blame lies with T-Mobile. HTC has given them the update a long time ago, T-Mobile decides when to roll it out. Great news for G2 owners!!! Gotta love HTC. They take care of business unlike LG. Very unhappy with LG right now. I think they just do fake promises thats all, the G2 is almost a year old now and not a single update eventh. is all stock. HTC was great now it sux! The phone is far from a year old. It was release in late September. There was at least one update I am aware of. Don’t blame HTC. Blame T Mobile as they have the update in hand. promises promises! give me my gingerbread so i can be happy with life. Yes but I’m still trying to confirm my intel, so far I’m NOT hearing this week right now. Things change though I know they are working fast and furious to get it out. You wanna be happy? Forget about technology and look you spiritual side! I agree. And I don’t mean any one established fanatic religion either. Time and energy spent hoping and waiting is just time wasted. I’m a T-Mobile retail store rep. Had a customer come in yesterday with a warranty exchange G2 running 2.3.3. The warranty exchange came preloaded with it. Customer wasn’t even aware til I noticed and pointed it out to her. Update is coming soon guys. Did you get a build number to compare against the leaked ROM? For being a stock Android phone (slightly modified as I call it), it’s taking them way too long to upgrade it. HTC is starting to remind me of another company people hated a lot last year because of delayed updates. It’s because of T-Mobile. Despite being stock, it’s not 100% stock. T-Mobile wants to make sure their bloatware is on the phone, so once HTC finishs an update, T-Mobile has to lay their crap on it, and god knows how long that process takes. That’s why the only real stock device is a Nexus device. 1 week short of 6 months for this update. Definitely sounds like that other company people hated for this same reason. Too late for me. Already switched phone OSes and I’m not looking back. Enjoy! To what os did you switch to? Feed it Gingerbread and then KILL IT! G2X needs to be updated sooner than later. Too many BUGS as it stands. I’ve gone through 4 different phones (returns) and all of them infested with BUGS. Hope for Gingerbread update/fixes to the bugs (reboots/freeze). this is about the G2. yeah.. they’ll push this upgrade out about two days AFTER i upgrade to the sensation! So. It’s a better phone. Yes the sensation is a better phone, but most Android phones that get rooted, ROMs flashed, bloatware removed, and CPU overclocked are actually better than any unrooted phone that will come out this year. If people would take the time to root their phone (not very hard), flash a ROM (even easier) , and overclock CPU (easiest by far) they wouldn’t have to wait for these stupid updates. ROMs tend to get updated a lot faster as well. The moment the source code is released DEVs step in and update their ROMs. Imagine that! no waiting a year or even a few months for the latest version of android. Also, i’ve seen the G1 running Android 2.3.4. So, if the first Android phone out can run the latest, then any other Android phone can run the latest version of android. Now my disclaimer, some phones out there are harder to root and flash ROMs than others, due to less DEVs developing for them. I have yet to see a phone that can’t be rooted and a ROM flashed on it. CM7 is pretty universal. The websites to hit (in order of usefulness) are; xdadevelopers.com, theunlockr.com, modaco.com, and phandroidcom. or just root and flash a custom ROM, which is updated even faster than Nexus device updates. ha. yea. that’s what i’ve been waiting for too, but i’ve been forcing myself to use touch keyboards on my g2 lately to try to get used to it because a nexus with a physical qwerty is never gonna freaking happen. the masses have spoken. they don’t want it. it’s just me, you, and my girlfriend, wicked. haha. Then, I guess I won’t ever have one. Although swype is very good, I still need a QWERTY. They need to stop trying to compete in every way with the iPhone. They could make a Nexus with a physical keyboard. I’m gonna miss my white notification bar..
G2? I’m still waiting on the update to the myTouch 4G. I’m starting to think we’ll never get it. And I’m not rooting. The MyTouch 4G came out AFTER the G2. How about we do this in order? I don’t give a crap if the bird came after the egg or vice versa. Just a date….that’s all. I guess that’s you’re problem, if you’re unwilling to use a great source that’s free and pretty easy to use. It’s gotten to where it’s harder to brick a phone than it is to root it and flash a ROM. If you’re worried about the warranty, you can always unroot your phone as well. Don’t be afraid of technology and innovation, if you’re afraid that is. Does anyone know if it will be 2.3.3 or 2.3.4? This is why people prefer to root. We’re at 2.3.4 on CM7 for quite a while now. I really think tmo is to blame here. HTC has done fine with all its other phones on other carriers…hell look how old the EVO is and it got gingerbread…. It also has a ghost voicemail icon. So, it’s not T-Mobile to blame if they don’t want problems with the update. Think about it, want an update that has more problems for you on your phone or wait a little longer for the update. IT’S FREAKIN VANILLA ANDROID (almost). What I’m not understanding is how the G2 is hitting end of life but the old phones like the Cliq/Cliq XT, MT3G/MT3GS, and all those other flops were being sold for more than a year? The G2 was a superior phone. I honestly wish I hadn’t sold it. It had its flaws like every other android but they weren’t bad at all. I got mine brand new in the beginning of December and sold it in April and never had a problem. I will never understand. Oh yeah, I wonder why I can’t sign into here with my Facebook. I keep getting errors. Almost would be the key word. I agree, some people have to have a physical keyboard. I choose not to limit myself that way, especially when SWYPE or T9 Flex is available. A physical keyboard on a phone is a feature, whether it be qwerty, T9, etc., so that negates the whole apples to oranges concept. They are both high end Android smartphones on T mobile’s network, therefore the comparison is perfectly valid. If I were comparing a physical keyboard to a phone or an OS to a phone, then that would be an invalid comparison. If I buy a phone at full price and unlock it, it can be use on TMO (with edge or less, I know, dont care about that). My questions is… will I get updates? I do not imagine TMO would update my (example) AT&T phone and since I would not have any AT&T service, I would not expect they will send me updates. In short, does someone who buys an AT&T phone get updates from anyone WITHOUT rooting! Because in many cases the time required for hardware development, deployment and distribution mean that when the phone was initially conceived, designed and produced, 2.2 was probably the most stable option available. Just because a phone was released last week that doesn’t mean it was designed and manufactured last week. It may have been in development for 6 to 10 months, long before 2.3 was considered stable enough for them to slap it in and hope to be ready for commercial release. In other cases where a device is considered a “flagship” product, they may go to more extensive lengths to try to get the absolute latest version of the OS installed, but that can potentially result in undesirable and unintended consequences that necessitate rapid deployment of bug fixes, or even recalls. The majority of “mainstream” consumers are probably not aware of this lag time and don’t know about the potential OS updates that are pending. Many Android users I know don’t even know what version they have, or that they even can get updates until the moment it happens. I know that phones are in development for months and all that, but in this landscape, with Android manufacturers should know by now, to make phones that will be ready for an immediate update, when its released. Like the G2x, I don’t know what it shipped with but, 2.3 has been out for a while now, and the manufacturer should have already been working to get it ready for the phone, for the past few months. Phones with no custom UI, like the G2, shouldn’t take any time to get updated. I don’t buy the hardware limitations spiel, when people have 2.3.4 running on a G1. And I know the current way things are are fine for the laymans, who don’t know much about Android, and what its capable of. But for me, updates are important. But now that I have rooted my first Android, I’ll probably go that route on future Android phones. But with Google, and other companies now blocking rooted phones from certain apps, I don’t like that. But the devs will eventually find a way around that too. i just got a replacement G2 device frm Tmobile n its running 2.3.3 but there is no update out yet. My replacement g2 comes in the mail tomm, I wonder if it will have 2.3 on it. It looks like it will not be Qtr 2 now since that ends today. spoke with tech support today they said tmobile g2 will not get gingerbread update and told me to contact htc. contacted 3 reps they told me that g2 will not get update because its not supporting update and crashing after loading update via ota.with sense or with out sense, I downloaded update via xda and was sure it would work phone is freezing wont power off to access phone settings to revert back to froyo 2.2 waiting on replacement will update post at later date after getting replacement. Had there never been a Gingerbread, would froyo have been good enough? I think so. What’s the big deal? Probably has something to do with the fact that they’ve been promising it for over half a year now. I would’ve been much more content if they simply said we’re not getting it at all instead of stringing us G2 owners along for forever. I bought my G2 with the explicit information from both Tmobile web site and store employees that the phone would be getting updates “raw” instead of getting the MotoBlur wrapper. Since then my Cliq XT has been upgraded and my G2 has not. wish I had it in writing. Don’t update if you use your phone for wifi tethering. After you update you will have to call tmobile and pay $14.95 a month for what used to be free. Dirty @ss tmobile won’t list this in the update contents. This update has RUINED my phone. I HATE HATE HATE it. No one will help me. There is NO informatin ANYWHERE about it. Gingerbread is a FUQUING DISASTER. I want the phone I bought a year ago, not a year of HELL dealing with this P.O.S. until I can get out of my contract. crashes more than teenage girls driving. i, along with millions of other people, are very displeased with the update.